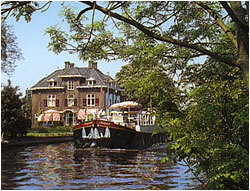 Her size offers a level of personnel service unusual on a hotel vessel. When entering the PanacheI you're struck immediately by the well-designed interior created for luxury, elegance and spaciousness. 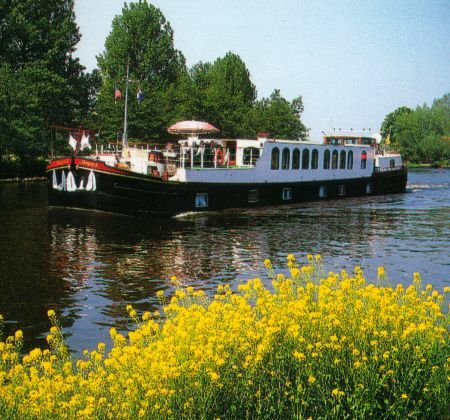 Relax in the beautiful surroundings and enjoy an unrivalled view from the large panoramic windows whilst cruising the inland waterways of Europe. In our dining room you will find French cuisine of the highest quality, served on the finest china and silverware, all of which combine for a memorable culinary experience. Our sundeck is the perfect place to relax, further enhanced by our enticing jacuzzi. What better place to appreciate the scenery! 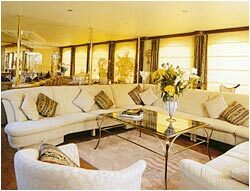 Cabin comfort is a priority on our barge. 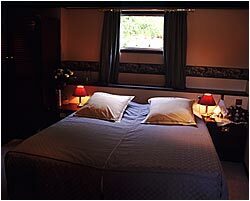 The bedrooms have been created to comfortably accommodate double or twin beds. 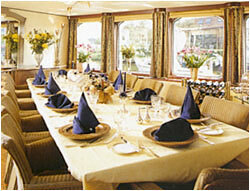 Each room has been furnished in old ship style with mahogany and brass fittings. If you wish to keep in touch with home affairs or wind down at the end of the day, then make full use of the Sat. TV and video library. 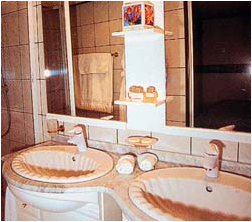 Our en suite bathrooms come fully fitted with double sinks, a large shower and all necessary amenities.